The odd planetary nebula, Sh2-174 is shaped like a rose floating in space. A strange nebula in deep space shines like a cosmic rose in a new photo unveiled just in time for Valentine's Day. The new image, released Wednesday (Feb. 13) by the National Optical Astronomy Observatory, may look like a wispy space flower, but it is actually an odd planetary nebula called Sh2-174. A planetary nebula is one of the last stages of life for most mid-sized stars. 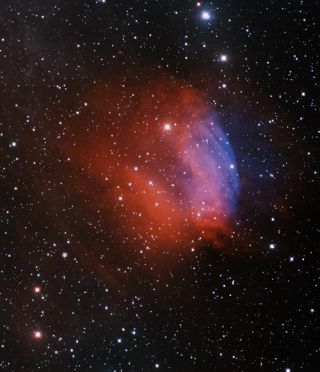 Once a star runs out of fuel, it begins to collapse in on itself, creating the clouds of red and blue in the photo. As the star sheds layers, it forms into a white dwarf — a densely packed star that has the mass of the sun, but is stuffed into a volume about the size of the Earth. The white dwarf star appears as a very blue star in the center of the blue region of gas in the new image. The off-kilter star arrangement is likely the result of interactions between the nebula and its surroundings, scientists said. Astronomer Travis Rector, a professor of physics and astronomy at the University of Alaska in Anchorage, took this photo using a 13-foot (4 meters) telescope at the Kitt Peak National Observatory in Tucson, Ariz. He used four different filters designed to approximate colors that the human eye can see. The strange positioning of the white dwarf probably has something to do with the way the nebula is interacting with the interstellar medium, NOAO officials said. The white dwarf is the bright prick of light in the middle of the blue gas on the right side of the picture. The new NOAO image is not the only space Valentine's Day offering for romantically inclined astronomy buffs. Space fans can send out electronic Valentine's Day cards with a space twist courtesy of the European Space Agency and NASA's Chandra X-ray Observatory. The European Space Agency space Valentine's Day cards include a collection of 15 celestial e-cards with images ranging from a satellite view of a heart-shaped lake to a dazzling rocket launch soaring into the sky like Cupid's arrow. The Chandra X-ray Observatory valentines include stunning e-cards of cosmic scenes in X-ray light, since the space telescope scans the universe in wavelengths of light invisible to the human eye.